Our answer to the sweltering long weekend ahead right here. Hi! How are you all doing? Are you sweating it out in the heat like we are here in California or getting drenched by the record rains we’re having in other parts of the country? My thoughts are with all those affected by Hurricane Harvey and I pray that you find yourselves safe and dry very soon. I’m amazed by the outpouring of love and support I’ve seen for Texas coming in from all over the world, and it makes me happy to see that there can be such kindness and humanity in today’s otherwise crazy world. 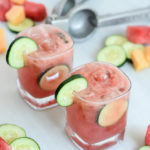 Whether you’re doing your best to get in some sort of body of water (and out of the heat) or avoid any sort of water altogether because you’ve seen way too much of it this past week, these Mixed Melon Cucumber Coolers are for you. They’re refreshing and hydrating for those of us who need relief from the heat, and they’re healthy and uplifting for those of us who need a welcome respite from the rain and bad weather. I talked the other week about how some of my OG flavor combinations (think your favorite Lip Smackers from when you were, like, eight) have been guiding recent mocktails I’ve created. 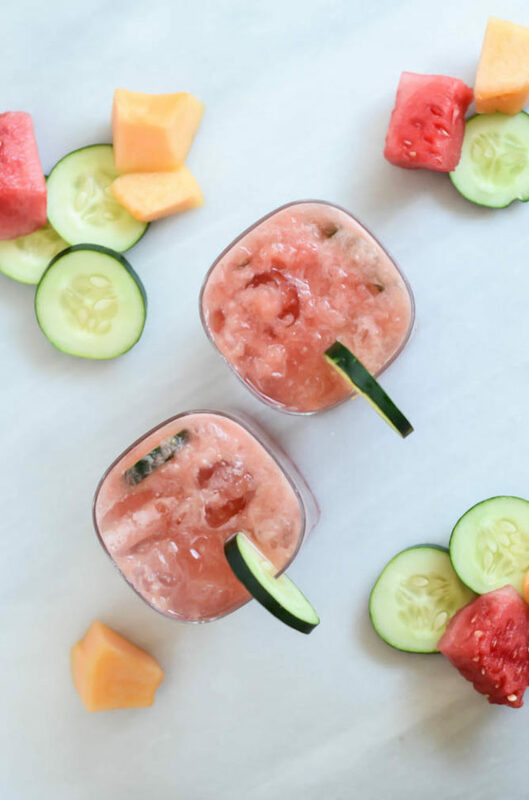 First there was this Kiwi Coconut Cooler initially inspired by my one-time strawberry-kiwi obsession, and now we’re bringing back the cucumber-melon combo with these Mixed Melon Cucumber Coolers! 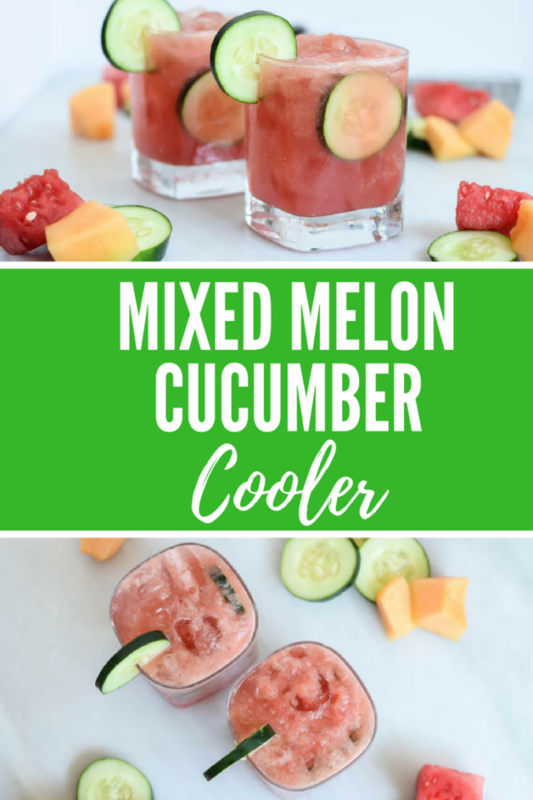 To get started making these Mixed Melon Cucumber Coolers, you’ll first want to get a hold of some of the finest cantaloupe and seedless watermelon available. You won’t need the whole fruits to make the two servings this recipe yields, but I’m sure you’ll have no trouble finding a way to eat up any leftovers. You’ll also want to track down some nice, crispy cucumbers. These add such a refreshing kick to the drink that if you close your eyes while you’re sipping you might just think you’re enjoying a relaxing spa day. Simply toss these three ingredients together in a blender, along with a fresh squeeze of lime to give it some tang, and give it a nice whir to make your juice. It will turn out a little on the thicker side (like a purée), but have no fear because we’re going to top our mocktails off with a nice little splash of sparkling water. If you’re looking for even more flavor, you could even use a lightly flavored sparkling water such as La Croix or Spindrift. Creative license is yours! 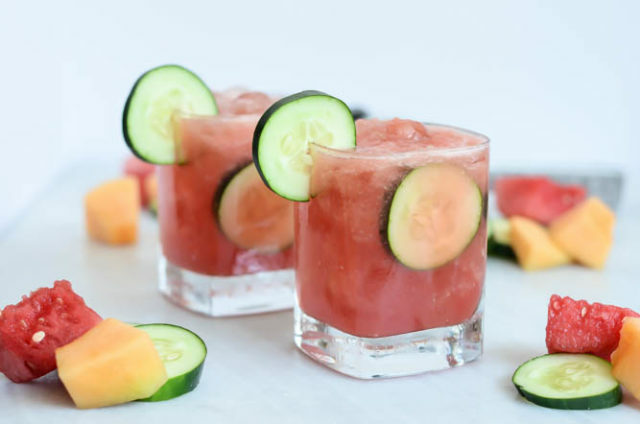 And since we only add a touch of cucumber to the juice (compared to how much watermelon and cantaloupe we’re using) we add some fresh cucumber slices to our glasses to further enhance that spa-like flavor. Oh, and I almost forgot. 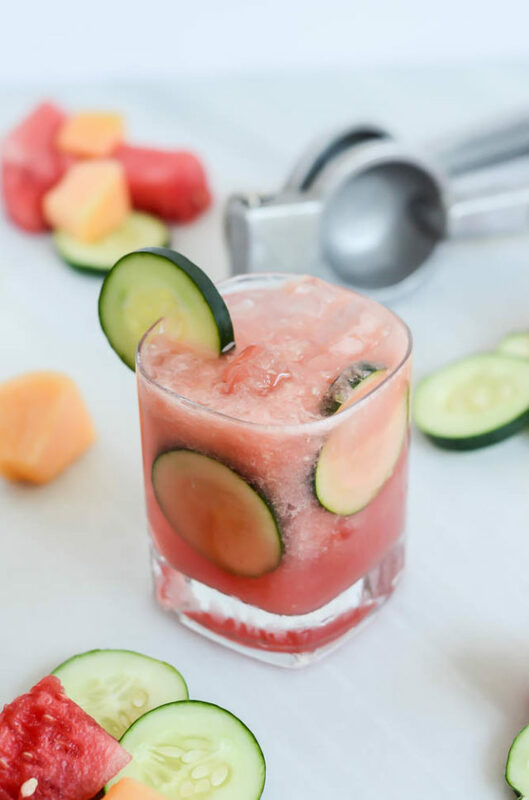 If you’re still on the booze train, add some gin or vodka to your Mixed Melon Cucumber Coolers to really knock it out of the park this weekend! The perfect, refreshing warm weather mocktail - loads of fresh melon punctuated by a hint of cucumber. Add vodka or gin to make it boozy! 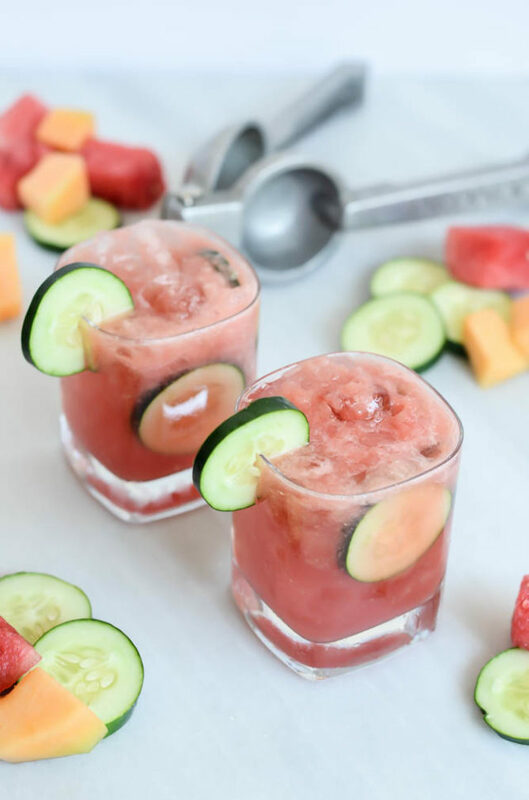 Combine watermelon, cantaloupe, cucumber and lime juice in a blender and pulse until a thick juice forms. Fill two glasses with ice and divide the juice evenly among the two glasses. Top each glass with sparkling water and slide a few extra cucumber slices down the inside of the glass for added flavor. Enjoy!